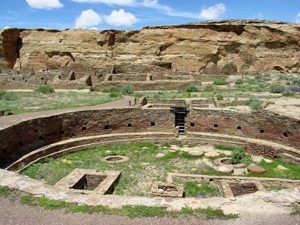 Chaco Culture National Historical Park – Chaco Canyon was the center of life for Pueblo Indians of the Colorado Plateau from 850 A.D. to 1250 A.D. Beginning in 900 A.D. the people built large multi-storied stone structures on mesa tops and on the canyon floor. This concentration of structures is thought to have served the region as a ritual, administrative and trade center. The largest building, Pueblo Bonito, rose four stories and contained 600 rooms and 40 kievs in a D-shaped layout. Another nearby structure, Chetro Ketl, had close to 500 rooms and 16 kivas as well as an enclosed plaza. The pattern of large public buildings with oversized rooms, surrounded by conventional villages, became the standard in Chaco Canyon and spread throughout the region. In the 1200s, change came to Chaco as new construction slowed and Chaco’s role as a regional center shifted to new cultural centers. Administered by the National Park Service, the park contains over 4,000 cultural sites associated with Paleo-Indian, Pueblo, Navajo and Euro-American occupation of the canyon. Chaco Canyon is located in northwestern New Mexico. The park can only be accessed by driving on dirt roads. El Morro National Monument – El Morro, also known as “Inscription Rock,” is a massive rock formation which rises more than 200 feet above the plains. On top of the formation are the remains of two Anasazi pueblos, the most complete of which is A’ts’ina, built in 1275 A.D. With almost 900 rooms this pueblo is thought to have housed between 1000 and 1500 people. El Morro’s base contains hundreds of Indian petroglyphs and the chiseled names of numerous explorers, soldiers, settlers and immigrants. The first European inscription was made in 1605 by Juan de Oñate, first governor of New Mexico. El Morro National Monument, administered by the National Park Service, is 43 miles southwest of Grants, New Mexico, off NM 53. Open daily. El Santuario de Chimayo – Constructed from 1813 to 1816 as a private chapel, this small adobe church is considered to be one of the most beautiful examples of Spanish Colonial architecture in New Mexico. Set in a large wall-enclosed garden, the church includes twin front towers, each with a belfry. The interior is a colorful mixture of Spanish and Indian styles with a heavy timber ceiling of vigas (beams) supported on carved brackets, simple plaster walls with large religious paintings and screens, a carved and painted altar rail and an elaborate reredos (altar screen) decorated with painted designs and religious symbols. The sands on which the church is built are thought to have miraculous healing powers, and today El Santuario de Chimayo is an active parish church. El Santuario de Chimayo, a National Historic Landmark, is located in the town of Chimayo, New Mexico, on NM 76 (the High Road). Open daily. 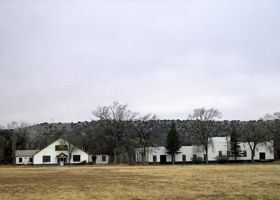 Fort Stanton – Fort Stanton was established in 1855 to help defend against Mescalero Apache raids in central New Mexico. Used as a center for military activities and as a point of departure for numerous scouting expeditions and raids, the fort was also the economic center for the region. The Mescaleros were permanently settled on their reservations during the 1880s and the fort was abandoned in 1896. The site contains officers’ quarters, stone barracks, corrals and stables, a parade ground and the old post cemetery. Fort Stanton is seven miles southeast of Capitan, New Mexico, via US 380, then south on NM 214. Fort Union National Monument – Fort Union, a bustling center of frontier defense between 1851 and 1891, was one of the most important in a string of forts established in New Mexico and southern Arizona. Originally built to protect the Santa Fe Trail, the fort was the largest U.S. Army post and supply depot in the Southwest. It also provided a base for campaigns against the Apaches, Utes, Navajos, Kiowas and Comanches. The fort was abandoned in 1891. Today an impressive array of building ruins are all that remain of one of America’s premier frontier outposts. Administered by the National Park Service, Fort Union National Monument is eight miles north of Watrous, New Mexico, at the end of NM 161. Gila Cliff Dwellings National Monument – Gila Cliff Dwellings National Monument preserves cliff dwellings and other significant archeological remains left by prehistoric American Indians of the Mogollan Culture. The well preserved cliff dwellings, constructed in the late 1200s, contain 42 rooms and are located within five natural caves in a narrow side canyon above the Gila River. The TJ Ruin contains un-excavated remains of a small pueblo inhabited for roughly 900 years beginning c. 500 A.D. Gila Cliff Dwellings National Monument, administered jointly by the National Park Service and the Forest Service, is 44 miles north of Silver City, New Mexico, at the end of NM 15. Hawikuh – Hawikuh, founded in the 1200s, was the largest of the Zuni pueblos and the first to be seen by Spanish explorers. Originally thought to be one of the fabled gold Cities of Cíbola, Hawikuh was conquered by Coronado in 1540 and served as his headquarters for several months. Hawikuh was referred to as the “Capital of the Zuñis.” A mission, La Purisima Concepcíón, was established at the pueblo but was destroyed during the Great Pueblo Revolt of 1680 when the New Mexico pueblos rose against the Spanish. Hawikuh was permanently abandoned after the revolt. In its prime, Hawikuh had up to 125 rooms surrounding a central plaza and stood four stories high with multiple numbers of kivas. Remaining are extensive ruins atop a long low ridge and the adobe mounds of the mission church. Hawikuh, a National Historic Landmark, is 12 miles southwest of Zuñi, New Mexico, off NM 53 on the Zuñi Indian Reservation.